The ultimate bouquet of color and fragrance! 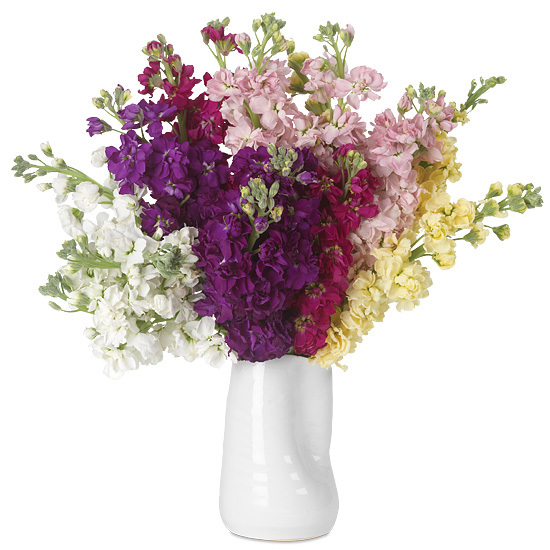 Stately and stylish, this generous bouquet blooms with double-blossom stock in a rainbow of favorite colors, including cream, magenta, white, pink, and dark purple. Situated in our white ceramic Tegan vase with contemporary, pinched cylinder design, each of the fifteen stems lends an enticing, spicy-sweet scent that will fill any room in home or office. 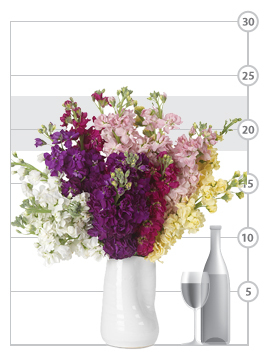 Arrange them by hue for a colorblock display as we’ve done, or mix them up for an equally beautiful look. Remove all foliage that will fall below the water line. Cut stems to the appropriate length of your container or vase. Do not be afraid to cut! Fragrant stock may look a bit tired upon arrival. Don’t despair! They’re healthy, just thirsty. They will rehydrate and perk up within 24 hours. IMPORTANT! Always add fresh water daily. Change water and recut stems every other day.